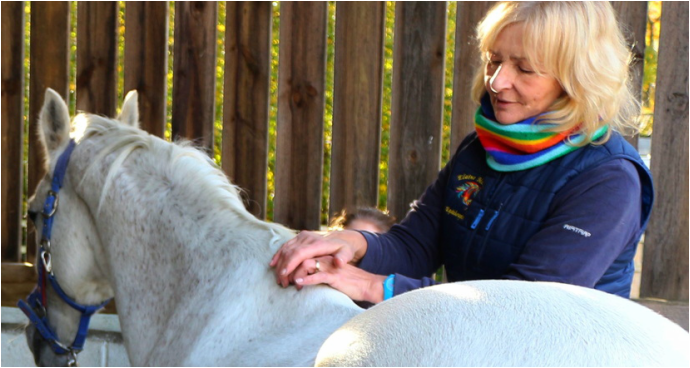 ​What is Equine Sports Massage therapy and how can it help your horse? Massage has an effect on mind, body and spirit. "Massage must be a living experience; this means that it must be a source of perception, a means of exploring via the fingertips the painful muscle as it tenses and relaxes. It is not simply an action, but a means of therapeutic communication, where awareness is the product of the dialogue between an organ in pain and the hand that detects that pain and removes it. It is impossible to heal with one's hands if the desire to comfort is not there." ​ ~ Dr Jean-Marie Denoix DVM, PhD, agrégé, the world's leading equine musculoskeletal anatomist. All horses can benefit from a sports massage treatment whether a treasured retired horse, a top competition horse or a horse undergoing rehabilitation. Used during training and pre and post competition, massage keeps muscles healthy, builds up those that may have wasted, maintains strength and suppleness and prevents atrophy even during a period of box rest or restricted work. After exertion massage minimises stiffness and speeds repair to tissue damaged as an inevitable result of physical stress and fatigue. Passive stretches help to keep or restore joints and muscles to full working capacity. Reduction of stress and tension and induces relaxation. Helps restore balance in soft tissue development. Enhanced venous and lymphatic flow assisting the removal of toxins from the body. Relief of muscle tension, spasm and trigger points. Prepares the body for activity pre-exercise. Assists in the removal of toxins post activity. Enhances normal recovery of tissue damage. Helps healing tissue retain mobility and minimises risk of scar tissue or adhesions. Enhances muscle tone and can help enhance/restore range of movement. In the event of an injury it can aid recovery and help prevent muscle atrophy. It may prevent injury by improving muscle usage before minor problems turn into major ones. In addition massage may help with rehabilitative training of the horse, particularly with regard to straightening the horse, thus enabling the horse to work at his or her optimum. My course project was based on how sports massage can help with the straightening of a crooked horse and I believe it can play a significant role in this in conjunction with correct tactful training. Touch has long been recognised as having positive effects on the well being of animals and humans in promoting wellness and healing. A healthy body equals a healthy mind. Even a small amount of discomfort may lead to a horse exhibiting anything from a lack of enthusiasm for work (or life) to a complete unwillingness to co-operate. Massage can help locate the cause of discomfort before it has become obvious. Some horses display a marked lack of awareness of where their body parts are (they lack proprioception) - massage may bring their awareness to these parts, thus enhancing body usage and enabling them to move as a complete horse. Horses who appear introverted or who are protective of their bodies often respond well to massage and learn to trust being touched, thus opening up a whole new line of communication. Not least if all, it is good to give something back to those who give us so much. A sudden dislike of being groomed or girthiness. A preference for work on rein. Reluctance to canter on one lead. High head carriage and/or dipped back. Head tilting or unusual tail carriage.